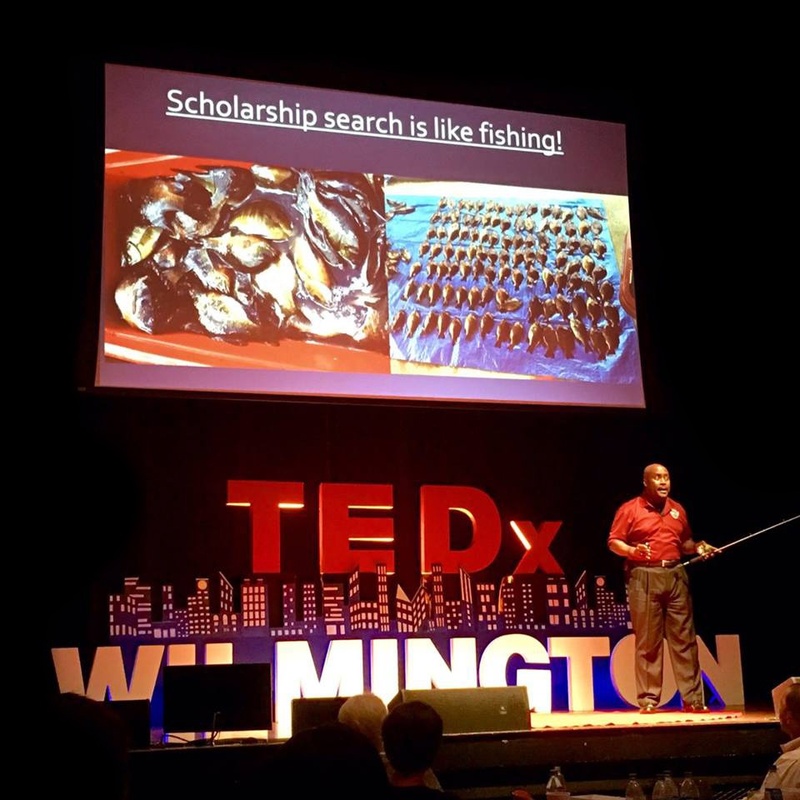 What Exactly is the Scholarship Leadership Institute (SLI) ®? 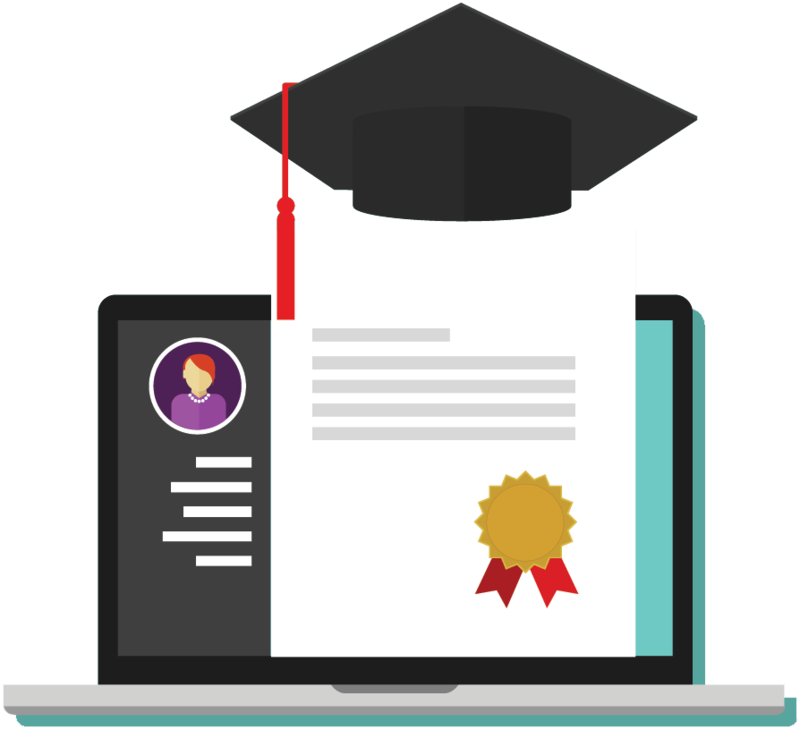 SLI ® consists of online and live self-study training and a membership program that shows you step-by-step how to get into and pay for college. It can help whether your student is a 7th grader or a student already in college. The course includes live monthly Q&A calls, timeline reviews, e-books, great websites, Facebook community, ongoing valuable monthly training, feedback, other resources and LIVE support by Major Betz (Air Force Retired). CLICK HERE to learn how you and your (1) company’s employees, (2) church’s congregation, (3) youth group’s members, or (4) school district’s students can receive huge GROUP discounts off our Monthly Membership! Your kid is a great student but doesn’t have any scholarships yet. The only scholarships you can find are mostly need-based. Lesser students at your child’s school are winning money like crazy! Many of your student’s friends are getting into their dream school! It’s too late and you are already dreading massive student loans! You are sick and tired of being sick and tired and you want to know what it takes to help your kids win some of that free money now! This Is Why I Created the SLI ® Monthly Scholarship Membership Program. 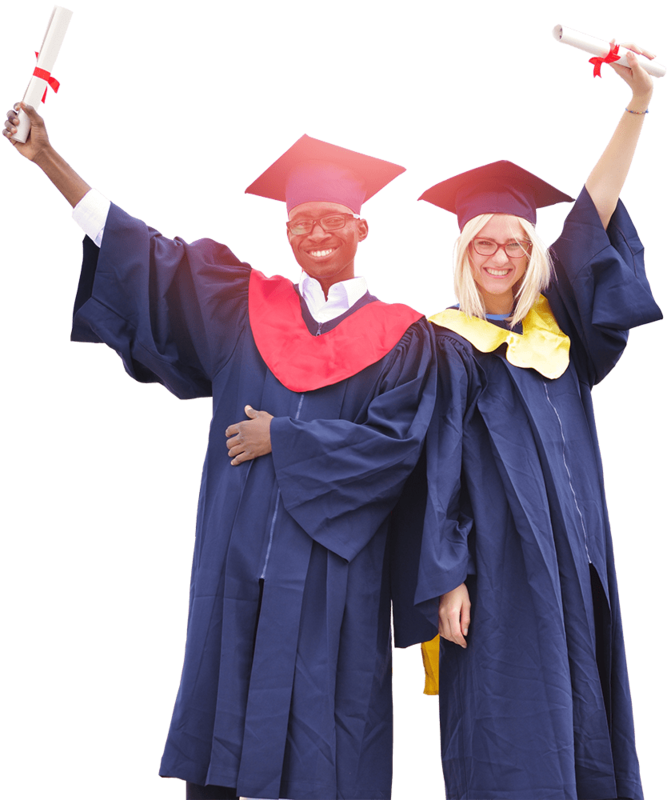 You CAN properly prepare your kids for college without hiring an expensive scholarship coach or college prep company, without the confusion and without the overwhelm. 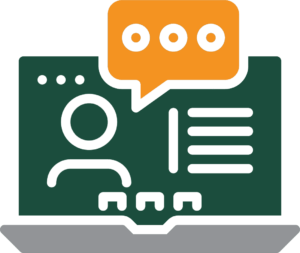 Major Betz’ proprietary Scholarship Success System makes the process of college prep and scholarship acquisition incredibly easy in a fun, exciting environment, where you have people to answer your questions and keep your student on track! There’s so many options for scholarship help to choose from out there and yet it’s still getting harder and harder to win scholarships. 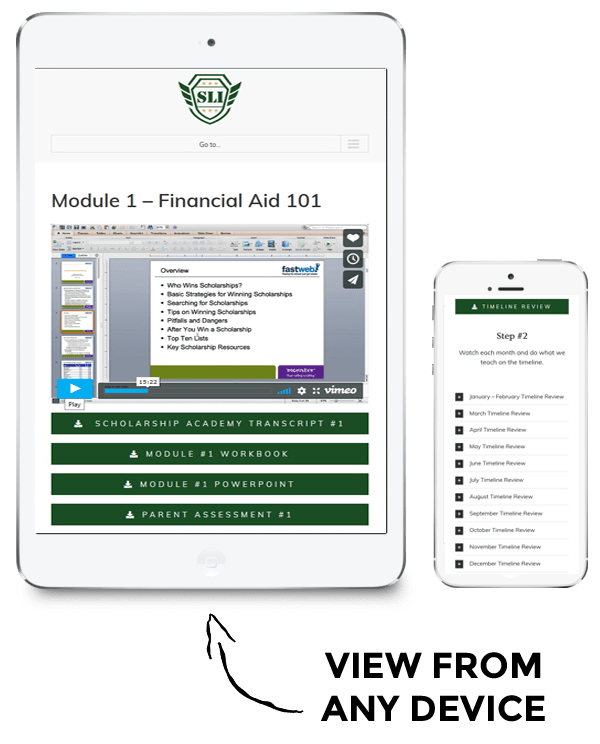 The SLI ® Monthly Scholarship Membership Program shows you month-by-month how to build your plan to win scholarships and get into the college of your choice. Why enroll in SLI’s ® Monthly Membership Program?? Who Is the SLI ® Monthly Scholarship Membership Program for? In SLI’s ® Monthly Scholarship Membership Program, I’m committed to your success! 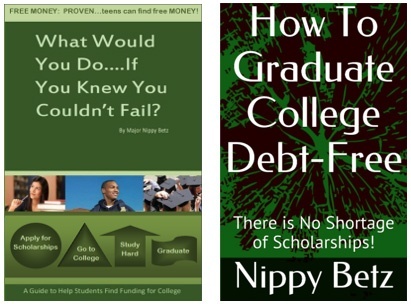 Follow my step-by-step College Prep and Scholarship Acquisition Timeline Review to guide you through building a beautiful scholarship portfolio and college prep plan of attack so you can graduate college debt-free. Receive training, support, feedback, resources AND MORE to avoid overwhelm and reach your goals. Monthly virtual office hours and live Q&A tutoring sessions by Major Betz and his team. Regularly released training videos influenced by the community needs to keep you up to date. Get direct feedback on everything from your scholarship search to college prep activities. Get feedback, advice and support from a community of future college students and their parents. Weekly virtual tips sent to keep your families focused on opportunities to win big $ for college. Receive exclusive members-only resources, tools, downloads, perks and discounts. Immediate access to monthly modules that include the step-by-step Scholarship search tips and strategies videos. Each video guides you through both college prep and scholarship acquisition strategies. Together with other members of the class, you and I will attend exclusive monthly recorded meetings online. This is where you get to ask your burning questions about all things scholarships and college preparation. I share my screen to walk through through any technical questions. I don’t leave until your questions are answered and you can always go back and watch the replay while you are in the membership. Each section below will be covered in class to build and maintain your efforts to graduate college debt-free. What Will You Need For Class? A commitment to being consistent and disciplined over time as we teach your family duplicatable processes that have helped our most successful scholarship winners over the years! 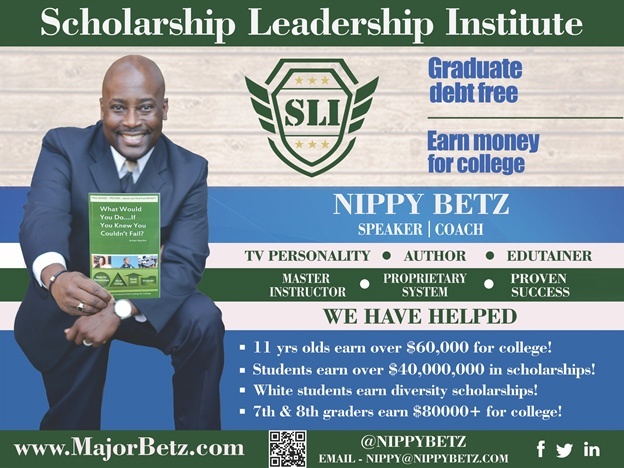 Hi, I’m Major Nippy Betz, the founder of the Scholarship Leadership Institute (SLI) ® …and helping families graduate college debt-free is more of a ministry than a business! I was born to help the masses avoid college debt! We started helping students win big scholarship in 2003 as a part of our church’s Education Department. Soon, other churches were asking for our help as kids from our church were winning big scholarships. We turned our passion into a very successful non-profit and then into a nationwide for-profit helping kids online that we have never met! I’ve helped 1000’s earn scholarships, 100’s earn 6-figures, and over 150 earn overpayments! We were recently given a notice of award for a Department of Education contract that would have paid us up to $17,000,000 to help 4000 7th graders all the way thru their freshman year in college! While San Antonio didn’t win the contract, we are still working with the local school district to help those 4000 students! We are also looking to help churches and fortune 500 companies help their congregation and employees earn money for their students by partnering with SLI and exposing them to our DISCOUNTED monthly membership! 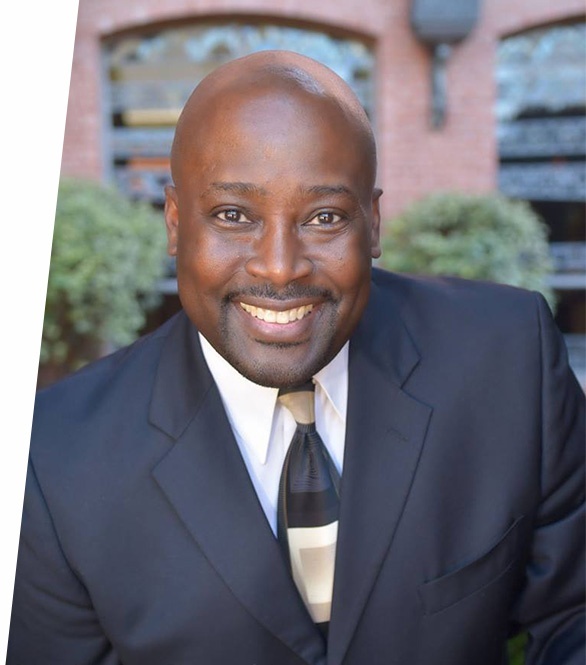 I am a 2-time Air Force Master Instructor, Former Adjunct Professor at San Diego State University, and a church youth minister. My Bachelor’s degree is in Computer Science and I have a dual Master’s Degree in Computer Information Systems and Space Systems Management. I recorded a popular TEDx Talk and wrote multiple books on Amazon that are a part of my courses. If you love what you see, you can become a member right now with no risk. Join the SLI ® Monthly Scholarship Membership Program and check it out for the next 24-hours, completely risk-free. If this is exactly what you’ve been in search of to help your kids earn money for college and graduate college debt-free, you can join me and other smart parents and students for a low monthly fee, which you can cancel anytime. You’ll have instant access to the entire Class. I’ll be walking you through each month of the process from start to finish and here to answer questions in the community group if you ever get stuck or need feedback. Click the button “Yes, I Want In” below the “Trial Membership” heading to start your trial now and take the class for a test drive. You have absolutely nothing to lose. CLICK HERE TO JOIN 3-YR PROGRAM TODAY! The SLI ® Monthly Scholarship Membership Program has a 24-hour no questions asked, money back guarantee. If you feel that the membership class is not right for you and you’re not 100% satisfied, you may cancel within the first 24 hours after joining. Just contact us and we will issue you a refund. No fuss, no hassles. Will Major Betz actually work with my teens? Yes. There will be others working with Major Betz to help the teens reach their dreams and goals. Yes. We use software that won’t allow us to see your full credit card #, so know that your info won’t be disclosed by my team. No. Unless we make a billing error we don’t do refunds because we don’t enable quitting on something this important. Yes. When/if you decide to cancel, just call us or send us an email. We will cancel your account on the day you notify us. Can you guarantee a teen will earn scholarships? No. But our success is well documented. Nobody will work harder to help your teen earn $ than SLI! Immediately for your initial payment. Then we will bill you monthly thereafter until you cancel or have paid what is due.